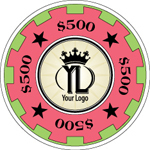 Need design ideas for your custom chip set? 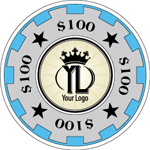 Here are nine popular and easily customizable design templates that you can use to customize your very own chip set, and we guarantee these designs come out looking outstanding when printed (as we've done them all before numerous times). 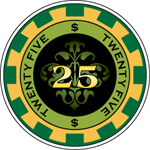 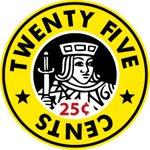 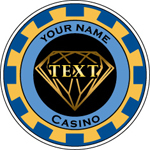 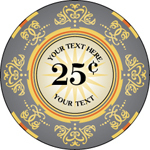 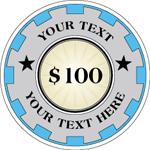 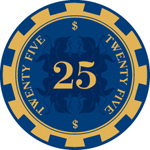 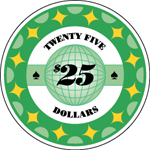 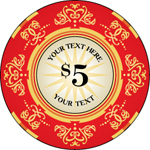 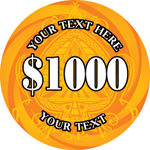 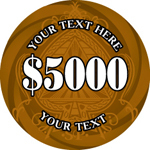 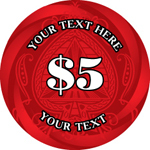 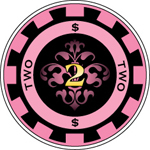 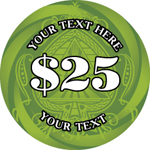 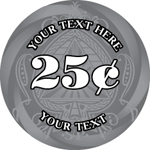 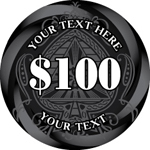 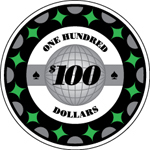 Just order the $29 custom poker chip design packge, and tell our artist which template design you like and then list any text and colors you want to swap out. 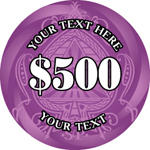 She'll customize the template however you like and send you an artwork sign-off sheet within a day or two. 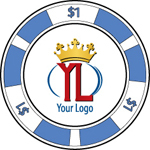 Swap out whatever letter and font you like, or include a full monogram.Note you can swap the chip and accent colors to anything you like as well, but we've found these dark colors with gold and white accent marks print outstanding. 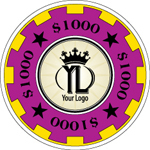 Swap out your company logo and company name. Note you can swap the chip and accent colors to anything you like as well. 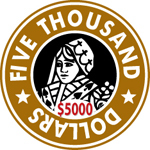 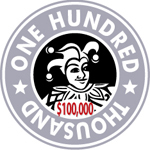 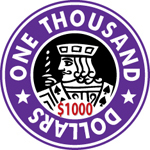 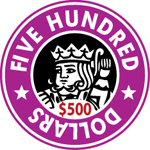 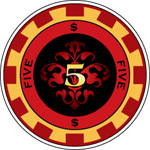 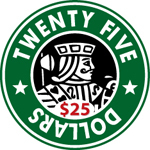 Swap out your company logo and company name, or the logo for your poker group. 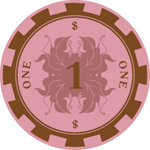 Use a different design on each side of the chip if you like, or just pick your favorite look and use that for both sides. 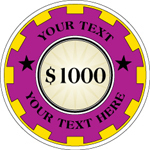 Note you can swap the chip and accent colors to anything you like as well. Swap out your text as you like. We recommend you use the existing colors for best printing. 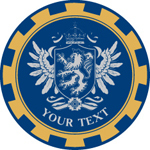 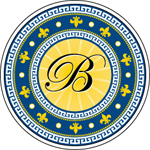 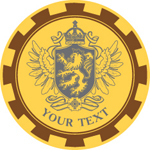 Swap out your company logo and company name, or use your family crest. Use a different design on each side of the chip if you like, or just pick your favorite looks and use that for both sides. 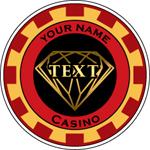 Note we used very non-traditional casino colors here (which print out pretty cool) - you can swap the chip and accent colors to anything you like, just keep a mind towards ensuring there is adequate contrast between the base color and the accent elements. .
Swap out your text as you like. 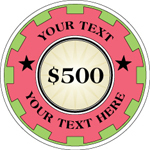 Note you can swap the chip and accent colors to anything you like as well. Based on our popular Venerati chip line, this design can be quickly customized by swapping out your text as you like. 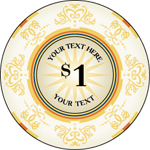 Note you can swap the chip and accent colors to anything you like as well, but we've found the light gold accents print best against dark backgrounds. We do not recommend you go with a dark accent color against a light background chip. 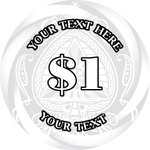 It doesn't print well. 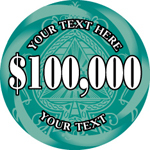 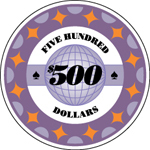 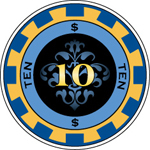 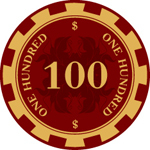 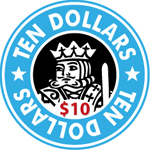 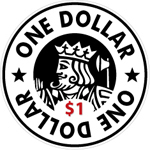 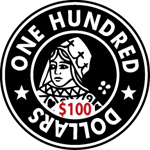 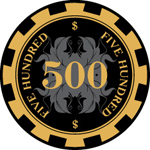 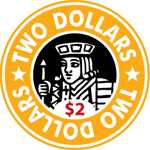 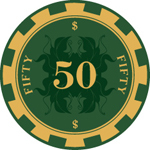 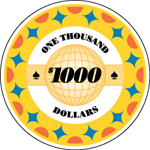 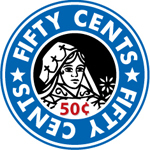 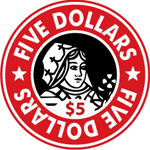 Swap out your company name or poker group name for the denomination text as you like. 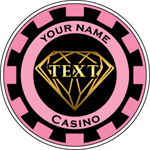 Note you can swap the chip colors to anything you like as well.